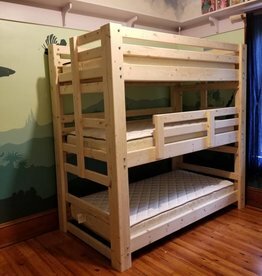 Our traditional bunk is the best way to get the most people stacked in the same space as a traditional 2-layer bunk. Measurements: 81" tall x 81" wide x 46" deep. 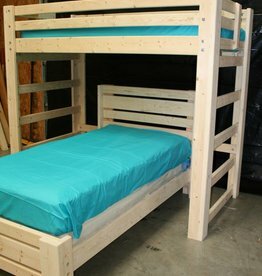 The Triple Play bunk puts the "fun" in functional! You choose traditional or t-shape with the slide position that best suites your room setup. Traditional Measures: 82" tall x 81" wide x 46"